A statue unveiled Monday at American Village in Montevallo, Alabama commemorates the brave military service of Alabama farmers. 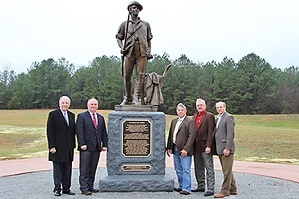 The Alabama Farmers Federation and Alfa Insurance co-sponsored the 16-foot bronze statue located on the American Village Freedom Trail. It especially honors those farmers who fought in the American Revolution. American Village founder and CEO Tom Walker thanked those who thought it was important to recognize this special group during a George Washington birthday celebration, which coincided with the unveiling of the statue. This statue is a replica of the Embattled Farmer statue in Concord, Massachusetts.